LightWave 3D has some excellent rendering options for hair. We have the native FiberFX as well as the Sasquatch plugin from Worley Labs. Unfortunately the actual creation and styling of hair guides is still a bit cumbersome in LightWave, which is a shame really as the quality of the renders can be of outstanding quality. FiberFX has done some progress in the effort of bringing hair styling tools into LightWave, but it’s still not as powerful as you can find in some other applications. And in the day and age of the common multi application pipeline you simply use the best tool for each job, if you have access to them. In my case I’ve have 3ds Max at my disposal, which has some pretty good hair styling tools. My problem was that I couldn’t find any decent solution to transfer the guides from 3ds Max into LightWave unless I shelled out another 2 grand. So I ended up writing this little LightWave modeler tool that imports hair guides (or splines really) via Autodesks ASCII Scene Export format, .ASE. 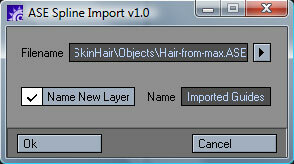 Check out my ASE Spline Import page for more details and to download the tool.